Mellben Seafood @Toa Payoh (Singapore) | Get Your Grub On! Bored of Chili Crab? Try The Bee Hoon! This popular coffeshop was introduced to me by some friends as until then my first stop for seafood had always been No Signboard Seafood in Geylang. Their main location is in Ang Mo Kio but we have always been going to Toa Payoh as it was a bit easier to reach. I was really excited to come back here as the last time I had a proper crab feast was a few months ago and since we were a group of six we could order several different types of these delicious crustaceans. We started off with some ‘Guiness Stout Ribs‘ that were sweet and sticky and so tender they fell off the bone. I remembered having them before but this time they really made an impression on me. On came the main attractions. First their signature ‘Bee Hoon Crab‘ (pic) which comes in a claypot and seems like it is drowning in the thin buttery sauce infused by the taste of the crab and hiding springy bee hoon noodles under the surface. The crab we had was the meatiest I’ve ever had in my hands and even the legs were full of sweet soft delicious flesh. Second on stage was the ‘Chili Crab‘ which was sure tasty but a pinch to sweet for my taste. Nevertheless all buns were gone at the end of the meal dipped in chili gravy. The closer and my favorite of the night was their ‘Black Pepper Crab‘. 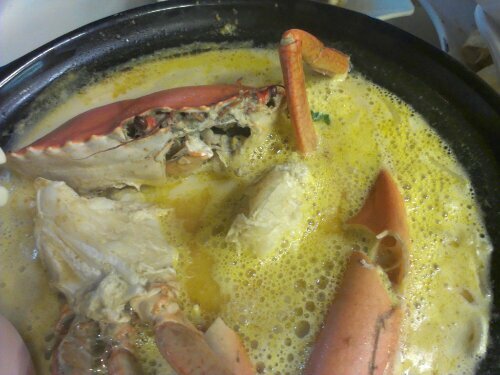 It wasn’t love at first sight with crabs and me mainly because of the messy eating process but once I discovered my love for this Singaporean favorite I quickly made the pepper crab my first choice. And I must say this one must have been the gold medalist among all the ones I had before. The tick pepper gravy sticking to the crab was so intense in taste and so good that I ate it to the last bit together with rice and all the onions inside. Literally finger-licking-good! I wasn’t disappointed before and haven’t been disappointed this time. What the shop lacks in atmosphere and location it sure makes up for in quality food and the friendliness of the staff who were always smiling and utmost polite. Recommended.